Step 1. Season pork with cumin, salt and pepper. Heat a frying pan to high heat, add 1 tablespoon of oil and cook pork until just done. Cover to keep warm. Step 2. Return the same frying pan to medium heat, add remaining oil and fry onion and capsicum until softened (about 5-7 minutes). Step 3. Warm tortillas in the oven (or microwave for 1 minute on high). Step 4. 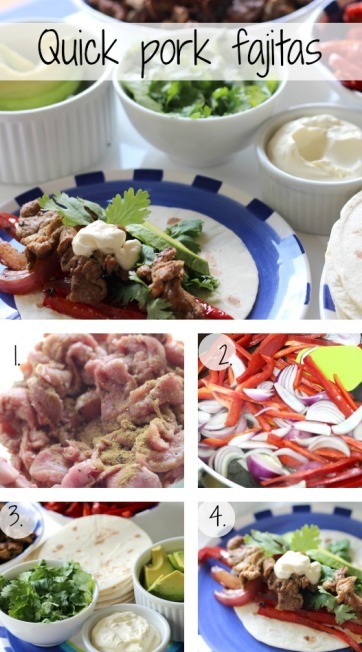 Place pork into tortillas, add capsicum mixture and top with avocado, coriander and sour cream. I was really surprised that cooking the pork in cumin was enough for flavour. But if you want a large boost of Mexican flavour you can add a sleeve of Taco seasoning. You can get the kids to assemble their own fajitas. These fajitas are perfect picnic food. Just cook and pop into containers for ease. If you have pork mince then these Pork and quinoa balls with sweet chilli sauce are great for picnics. You can pop these Pork and sage cannonballs onto a party platter for your little pirate. If you make this Pork and sage meatloaf with apples you will wish for lftovers so you have slices on sandwiches the next day. When you want to keep those flavours Mexican then try these Pork and bean enchiladas. You can also have these Pork and chickpea tortilla. If you want your pork slow cooked to fill soft rolls then this Healthy pulled pork is delicious with a side of coleslaw. You can have this Pork and mango noodle salad for a healthy fresh Summer salad. When you are looking for a easy starter these Pork and prawn dumplings recipe can be made ahead of time and steamed just as your guests arrive.